"I'm not going anywhere near that litter box. You try using it." You decide to try a new brand of scented litter to get rid of some of the disgusting odors lurking from Smoky’s litter pan. Sadly, she sneezes every time she goes near it and seems to have other allergic reactions. It might be time to go back to the old stuff. Cats are very finicky about what’s in their litter box. Not all kitties are sensitive to strong scents, but some varieties of scented litter are so smelly, your beloved buddy could actually be allergic. The aroma may not be the only thing bothering her though. Maybe the new stuff is much dustier than the old litter. Every time she digs a hole, she inhales a cloud of dust, making it hard for her to breath. If her litter is sending her allergies into a frenzy, she’ll most likely sneeze every time she goes potty. After walking away from the box, her eyes will be watery and she might be wheezing. You might notice that her paw pads are bright red as well. Because her paws are so itchy, she’ll nibble at them, tugging out some of the fur in the process. Eventually she’ll have bald red patches on her paws -- a sure sign she isn’t having a pleasant experience with her toilet. If you suspect that Smoky is allergic to her litter, remove the lid immediately, if her box is covered. Lids cause the scent to stay in the box and magnify the aroma. Taking the lid off minimizes some of the smell until you can change her litter. 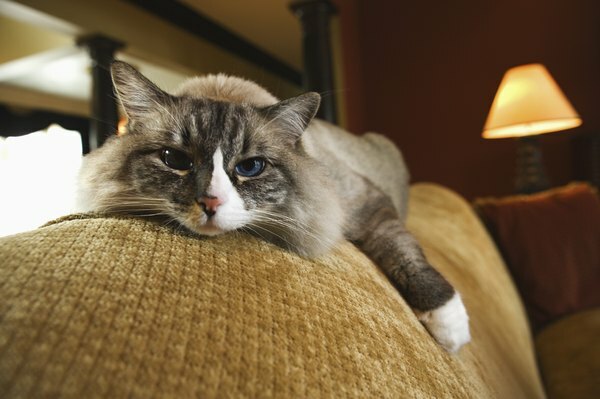 As soon as you can, pick up a bag of her old litter or something that is unscented and labeled as “dust-free.” Pine pellets, newspaper pellets or even plain old unscented non-clumping cat litter are each usually mild enough for sensitive felines. The litter may not be the only source of her allergy. Plug-in scented wall units, spray air fresheners or the carpet deodorizers you use near her litter box can all contribute to Smoky’s allergy outbreak. Make her environment as neutral as possible by eliminating any of these strong-scented items until you get to the root of the problem. If Smoky’s allergies are causing open sores on her skin, if she stops eating or if she seems to be losing weight, take her in for an exam right away. Your veterinarian might need to give her medication to get her allergies under control. What Are the Strongest Cat Litter Box Liners?